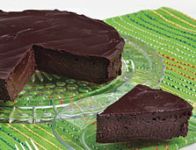 This cake has a moist, gooey texture and a taste like the combination of chocolate truffles and chocolate brownies. It is certainly a chocolate lover's dream, but a dieter's nightmare. Mix the sugar and flour in a mixing bowl. Break the chocolate into small pieces, and melt it in a double boiler over hot water. Add the butter, also cut into small pieces, and stir with a whisk until smooth and glossy. Remove from the heat and cool the chocolate butter mixture until it is warm to the touch but not hot. Add the sugar and flour gradually while stirring. Add the eggs one at a time, while whisking. Finally, add the orange liqueur and stir until well blended. Transfer the batter to a 10-inch springform pan which has been lightly oiled and floured, and bake at 400°F for 25 minutes. Allow the cake to cool to room temperature, and chill it in the refrigerator overnight.